My Jungson Hedo/Duro was bought May 2012 as I was getting tired from moving the 30 kgs JA88 from our living room to my workshop - and back again. 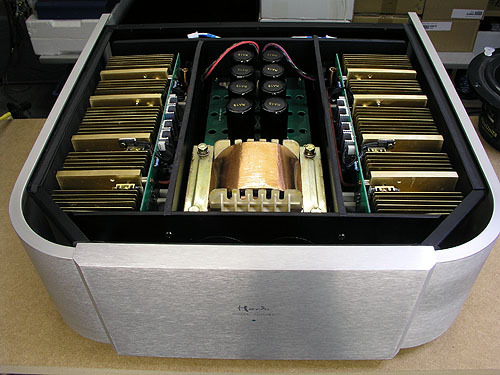 The Hedo/Duro is the power amp section of the Jungson JA88D-09, stripped to the bones to keep cost low. Fortunately the good sound is not impaired. 500 USD is a steal, but it has to be said that with DHL shipping + insurance + VAT + tax, the price doubles before it enters your premises. Still a steal to my ears. It's currently driving the Jenzen-D speakers and it sounds wonder. For Danish readers I paid 4787 DKK for the amp incl. shipping and insurance (PayPal). VAT, tax and handling fee was 983 DKK; in total 5770 DKK (1005 USD). Bought from Cattylink, Hong Kong. The Hedo/Duro comes with both single ended and balanced inputs, the latter designed for the Jungson Primo pre-amp. 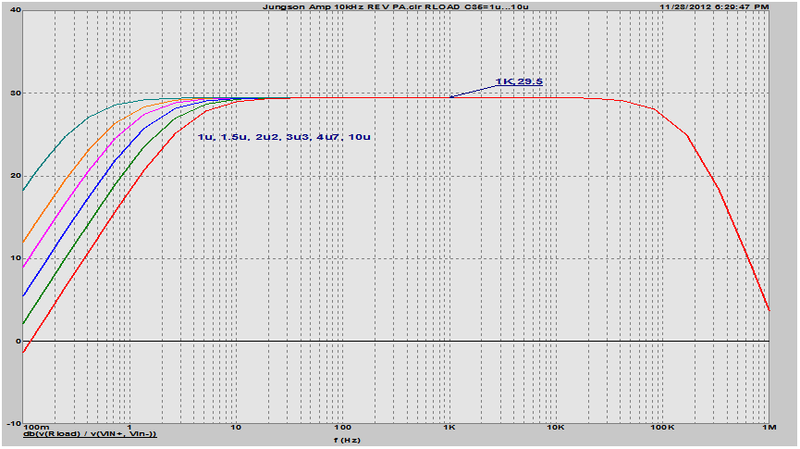 I use my WOT line stage and run the Duro in balanced mode. 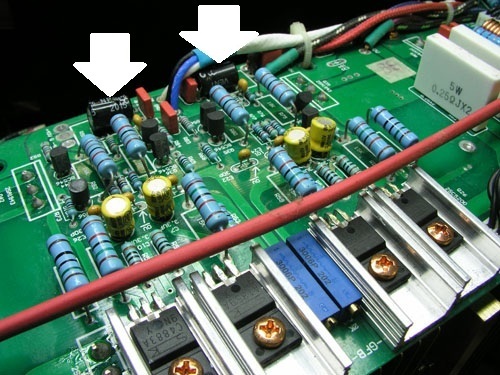 The single ended input (phono sockets) runs through a small circuit as seen above to the right. 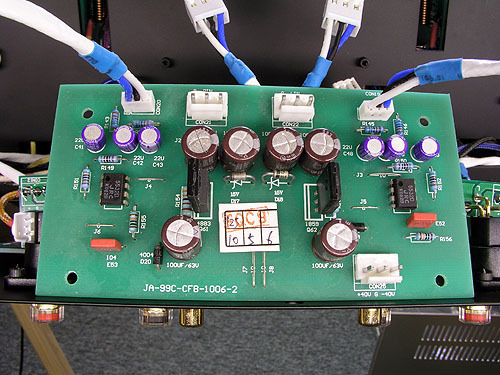 This turns the single ended signal into a balanced signal, which is connected in parallel to the XLR input sockets. I can't decipher the circuitry but I suspect the signal passes through some electrolytics! See later as a kind reader mailed me the schematics of the power amp section. Left: Speaker terminal board also holds speaker relay and probably some protection circuitry. Better leave this as is. Only thing I miss is a second pair of speaker terminals for bi-wiring. I'll add another pair as I often use this with the Jenzen speakers. 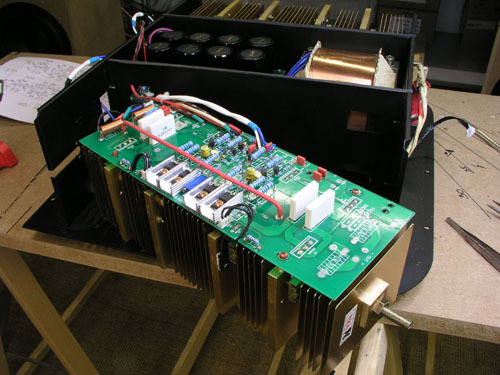 Download power amp section schematics here. Thanks to Mark, the schematics can be downloaded above. 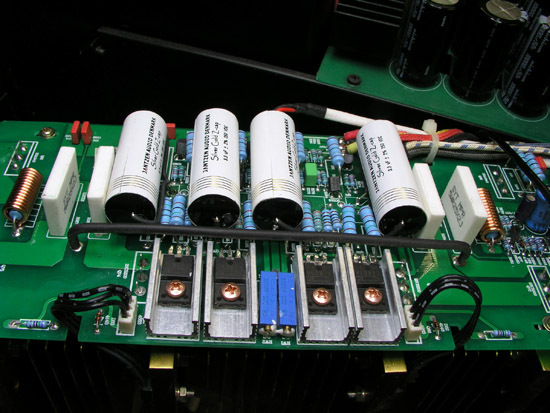 This displays two nasty electrolytic caps at the SE input, protecting the power amp from DC. Now, if we have a line stage with coupling caps at the output - or a transformer coupled line stage like my WOT - then these caps are not necessary. I removed the caps and inserted a bridge. If your line stage is not AC coupled, leave the caps in place. Left: The two electrolytic caps. Right: Replace by bridges. More left: The two blue pots adjust DC offset of your power stage. Right: Cheap electrolytic caps between driver stage and power stage. 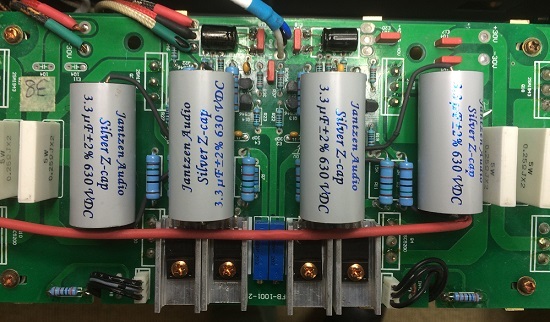 2013: I've changed the yellow coupling caps by 3.3 uF/250V Silver/Gold from Jantzen Audio. By doing so it appeared there's an error on the print layout as one legs of the second cap (from bottom) is soldered directly to the nearby resistor, encircled in red. I wasn't aware of this when I made the photos and haven't got a close-up. 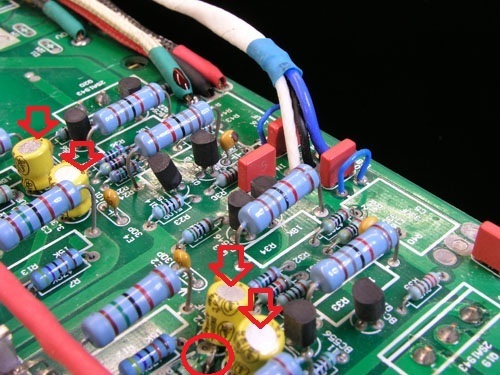 If your amp has a similar issue, make sure soldering the new cap to the same resistor. I didn't take photos of the session but you can see a similar operation for my Jungson JA88D-09. As for the JA88 you should consider size of your replacements, e.g. max 17-18 mm diameter. As suggested below you may go down to 1 uF. I know 8 super caps just do not appear in your mail box for nothing, but if you really want to hear what your JA88/Duro/Hedo can do, short the input caps and replace the electrolytics with modern super caps. I later replaced the Silver/Golds by Silver-Z and didn't notice much change, if any. Left: The modded Jungson JA88D-09. Right: Silver-Z caps in the Duro. And you can trim idle current with *R. But I would not change the 0.4+0.4A idle current unless you have full control of thermal stability! Using RW3 you can trim DC offset at the Output_L+, and RW4 to set the DC offset at output_L-. To trim, first short the inputs so that the inputs are not floating picking up noise and hum. 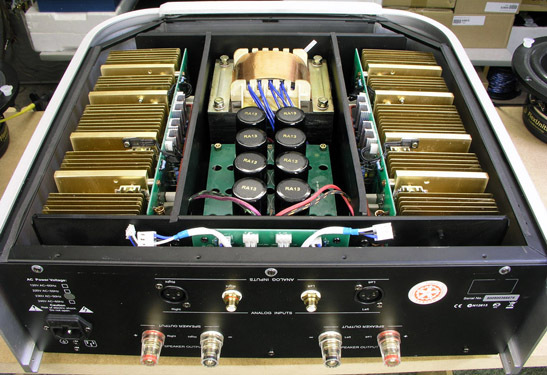 Let the amp warm up with casing closed for several hours in the place where it is to be used – stereo rack? Floor? Makes a difference! Then remove casing lid (if needed) and trim the pots individually. 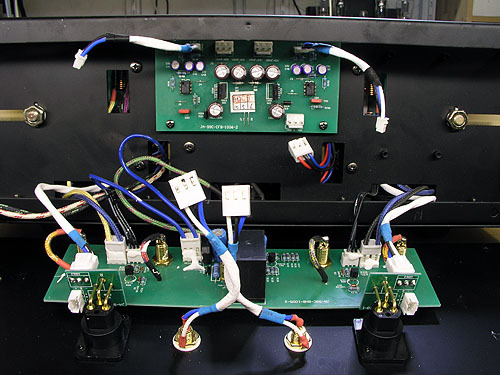 They are not linked together so you can trim each individually so that the output voltage measures as close to zero as possible (<50mV or so), and then put on the lid, and let the amp be powered on for some hours and then redo the trimming if needed. 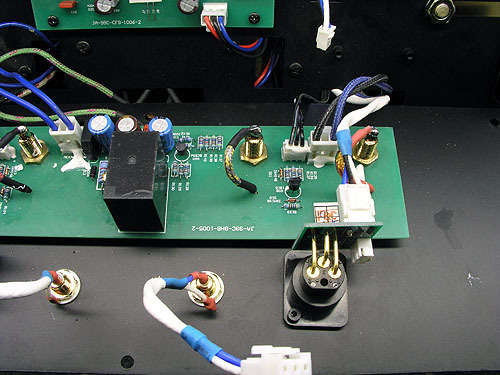 If you cannot trim DC offset down to <50mVDC or so, trim both output to the same value, as they will then cancel out when you connect the speaker wires to the + and - outputs, and thus get cancellation (for ex 50mV – 50mV = 0mV). I wonder about the class A power from the 30kg beast. Now that we have the schematics with component values, we can easily calculate how much power the amp really outputs in pure class A (and B if we want). Here are my findings. PclassA = Irms x Irms x Rload. Ibias = 0.4x2=0.8A. This is the maximum current that a sine wave can have on the positive side. The negative side of course also can swing this much as we use a push pull design. So, Irms = 2 x Ibias / sqrt(2) = 1.13Arms. 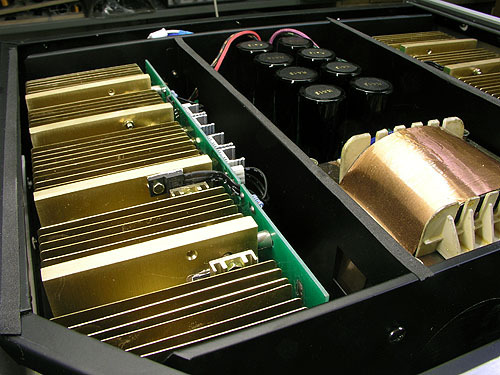 Now, we do have two of these amps per channel in a bridged configuration. What does this mean for the class A power? Well, in bridged configuration, we have twice the voltage swing, so we get 4X the power, right? Yes, and no! We do get more class B power but do we really get more class A power? No, we do not. Also note that in bridged mode, each amp “sees” half the Rload. 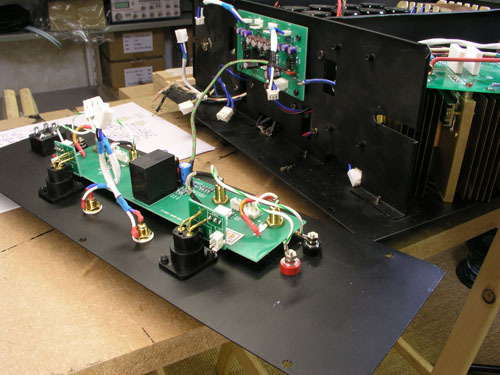 The power dissipation without music playing is high and that not only depends on the relatively high Irms but also because we have 4 amps. Here's a simulation showing how the low cutoff is affected by the design having 1u, 1u5, 2u2, 3u3, 4u7, and 10F caps for all four of the “4u7” electrolytic caps in the middle of the schematic.